As depicted in the mesmerizing new documentary Under Great White Northern Lights, The White Stripes don't like to take the easy way out. Nearly three years ago, during the summer of 2007, the band celebrated their 10th anniversary with a tour of Canada. 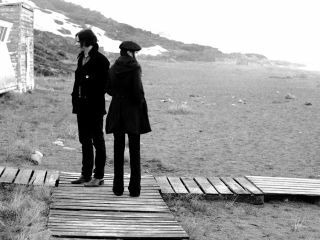 Only this wasn't the usual rock star jaunt: the two vowed to play in every province, territory and far-flung locale they could because, as Jack White puts it, "Canada is the only country that's ever turned us away." They staged renegade shows in places such as Whitehorse, Yellowknife, Glace Bay and the arctic tundra town of Iqaluit, to name a few, in settings that would make most bands question the functionality of their GPS devices: a pool hall, a bowling alley (with guitar slung behind his back, Jack rolls a big eight), a YMCA center, a city bus, a community center for the elderly - even a fishing boat. The point to all of this, apparently, is that the long, hard and lonely road offers the greatest truths. Work can be its own reward. Whether it's placing your guitar picks far out of reach on stage or performing without a set list (too easy), most of the time, work - strange and dirty work - is all there is, a fact of which The White Stripes seem acutely aware. Face it: once you've seen one cinderblock arena dressing room, you've pretty much seen 'em all. But witnessing a dozen non-English speaking Inuit seniors tapping their toes to a stirring rendition of a Blind Willie McTell blues tune - now, that's a once-in-a-lifetime event. Staging a hit-and-run, one-note outdoor concert in front of 200 revved-up fans in St John's, Newfoundland and Labrador and not getting murdered when it's clear no encore is coming (the band slams it down, waves and splits) - that's like panning for gold and shouting, "Eureka!" These are the kinds of moments that director Emmett Malloy, who shot the film in 16mm, seems most intent on capturing. While he doesn't always escape the Ghosts Of Rock Docs Past (the image of Jack and Meg, nattily attired and posing next to a pair of matching prop planes, recalls scenes from Gimme Shelter in which Mick Jagger and co, decked out in rock star finery, enter and exit helicopters), the very nature of the Stripes' grand plan almost ensured ground would be broken. Jack practically reduces his Montgomery Airline and Kay guitars to splinters as he pulverizes his audience with waves of untamed sound. In many ways, Under Great White Northern Lights is the kind of film U2 had hoped to make in 1988 with Rattle & Hum. That movie, however, imploded because of its wearisome, staged 'spontaneity' - the band discovering their American roots at Sun Studios, the boys soaking up the blues from BB King, Bono getting his gospel on with a Harlem church choir - that resulted in nothing more than flagrant self-deification. Elaborate concert scenes that were meant to inspire awe came off as slick and studied; the big hit songs were dispensed with expert precision but without a sense of wonder. There was no danger, no risk of falling on one's face. The movie was an arid affair, a promotional gimmick. Worse still, it made the band seem, for a time, just as contrived. By contrast, the Stripes appear to flourish when they're on the verge of falling apart (or looking just plain silly), and surprisingly, nowhere is this in evidence more than in the larger-venue readings of their best-loved numbers. On songs such as Let's Shake Hands, Black Math, Elephant and Seven Nation Army, the duo are vicious forces of nature that both oppose and attract. Jack practically reduces his Montgomery Airline and Kay guitars to splinters as he pulverizes his audience with waves of untamed sound; likewise, Meg's unorthodox style of drumming - 97 percent of the time she favors the crash over the hi-hat; this could work for no other band nor any other style of music - has to be seen to be believed. But as unhinged as the two get on stage, they are still capable of achieving an intimate, emotional connection that cannot be artificially produced. It happens when Jack, banging furiously on an electric piano, casts Meg a sidelong glance and yells "Play faster!" That she immediately does so isn't all that amazing; that she probably didn't even hear his direction is what matters. It happens again during Meg's torch-song turn in the spotlight for a deliciously sensual In The Cold, Cold Night. Rather than stand by her side and strum his guitar, Jack prowls the stage with his instrument, slowly dancing by himself. He glides, struts and sashays, and while he's very much his own planet, spinning to the propulsive frequencies of his vamped chords, he's also orbiting around Meg, the sun. Those looking for juicy bits of personal minutia will be sadly let down: the two don't discuss their short marriage; in fact, little about their relationship is addressed. Oddly, during one of the movie's brief interview segments, Jack still refers to Meg and himself as "brother and sister." About all we learn about the duo as people is that Meg chain-smokes, Jack likes Pellegrino and the two sometimes disagree about how well they rocked on any given night. Behind The Music this is not. However, it is the film's final sequence that offers the most poignant - and possibly most revealing - analysis of the pair. Jack and Meg sit on a piano bench together, where the former serenades his ex-wife, "sister," best friend and muse with a tender White Moon. The song brings Meg to tears, proving that no matter how powerful their impact on the world may be, their influence over each other is their greatest accomplishment.